Name: Janice (Jan) Todd, Ph.D. Hometown: Lock #4, Penna (Birthplace); Graduated high school in Plant City, Fla.
Current Pursuits: Founder and Director of the H.J. Lutcher Stark Center for Physical Culture and Sports at the University of Texas at Austin; Professor, Department of Kinesiology & Health Education, The University of Texas at Austin; Co-editor of Iron Game History: The Journal of Physical Culture. I also work as co-director of the Arnold Strongest Man Contest held each year in conjunction with the Arnold Classic. 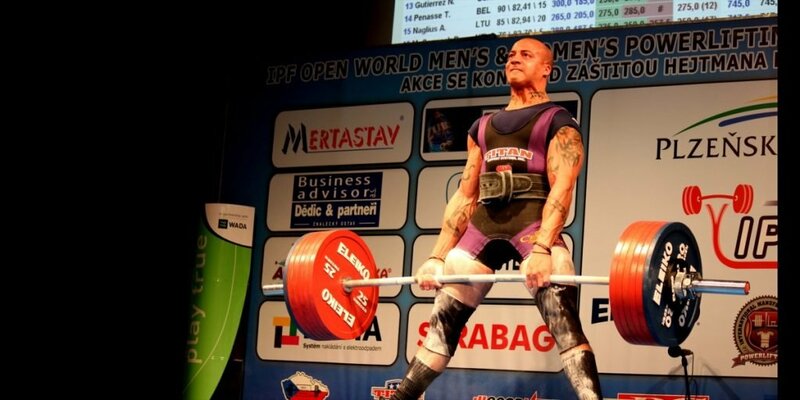 When did you get involved with powerlifting and what got you interested in the sport? I began lifting in 1973 shortly after marrying Terry Todd who was powerliftingâ€™s first superheavyweight champion for men. I didnâ€™t compete in a contest, however, until May of 1975 when I lifted at the Chatanooga Open and broke my first record. 1975 Broke 49 year old Guinness record in the two-hand deadlift with a lift of 394.5 pounds in first competition. Chattanooga, Tennessee. 1976 First woman to officially exceed 400 pounds in any powerlift with a deadlift of 412 pounds, Sydney, Nova Scotia, Canada. 1978 First woman to total over 1, 000 pounds in the three powerlifts (squat, bench press and deadlift), Stephenville Crossing, Newfoundland, Canada. 1977 First woman to officially squat more than 400 pounds. 1978 First woman to total over 1100 pounds in the three powerlifts, Stephenville Crossing, Newfoundland, Canada. 1979 Lifted the highest total of any woman in the First IPF Women’s World Championships, Billerica, Massachusetts. 1979 First and, as far as I know still the only woman to lift the famous Dinnie Stones in Scotland. [In the highlands of Scotland, lifting boulders was one of the rites of passage into manhood, thus they are called “manhood stones.] The Dinnie Stones, at 780 pounds, are the heaviest such stones in Scotland and have been lifted by only a few men over the centuries. 1981 First woman to exceed 500 pounds in any powerlift: 507-pound squat, Memphis, Tennessee. 1981 Established my highest world records in the heavyweight division: world record squat of 545.5 pounds, world record deadlift of 479 pounds, and world record total of 1229.5 pounds. Columbus, GA.
1982 First woman to total over 1200 pounds in the three powerlifts, Atlanta, Georgia. 1982 First athlete (male or female) to establish a world record in the newly formed American Drug Free Powerlifting Association: 446-pound deadlift at a bodyweight of 148 pounds, Mobile, Alabama. 1984 American Drug Free National Powerlifting Championships–Gold Medal. 1984 American Record deadlift: 463.5 pounds at a bodyweight of 163. 1996 American Master’s (40-44) Record in deadlift of 425 pounds. American Drug Free Powerlifting Association, Austin, Texas. I was directly involved in the development of the sport of women’s powerlifting. Cindy Reinhoudt and I drafted the first rules to govern women’s competitions and I helped Joe Zarella organize the first national women’s meet in 1977. When I moved back to the United States from Canada, in 1979, I became Chairwoman of the United States Powerlifting Federation’s Women’s Committee, a post I held until 1984. I wrote the first constitution for the Women’s Committee of the USPF; lobbied for and ultimately achieved autonomy for the women’s committee; but finally abandoned the USPF when I could not convince the organization to institute a steroid testing program for women lifters. I was elected to the USPF Executive Committee [for men and women] in 1979, the first woman to serve in that post. In addition, I served from 1979 to 1984 as Chairwoman of the International Powerlifting Federation’s Women’s Committee and helped to draft the international rules for women. I was also on the IPF drug testing committee for several years. In 1981 [Calcutta, India] and in 1984 [Dallas, Texas] I was chosen as the coach of the USPF’s Men’s World Championship Team. Both teams won first place in the world championships. I believe Iâ€™m the only woman in to have ever served as head coach of a men’s team at the World Powerlifting Championships. I was also head coach in 1991 and 1984 of the USPF Women’s World Championships teams, both of which won their respective championships. At the collegiate level, I coached the University of Texas Longhorns to numerous ADFPA Men’s and Women’s National Collegiate Championships between 1986 and 1996. (I then retired as the UT coach.) I also coached the menâ€™s womenâ€™s team at Auburn University and produced many collegiate and national champions. In 1982 my husband, Terry, and I promoted the USPF Womenâ€™s National Championships at Auburn University. Most memorable lifters? in you career: If I could, Iâ€™d like to qualify this a bit. In terms of athleticismâ€”sheer raw talent for liftingâ€”the two women who impressed me the most back when I was lifting were Majik Jones who did an over 400 pound deadlift in the 105 pound class (clean) and Terri Ptomey (also cleanâ€”and who I coached) who beat Jennifer Weyland at the 1982 womenâ€™s nationals. Both these women were extraordinarily gifted and sadly, both faded very quickly from the scene. However, the person I believe should be considered the most significant lifter of my generation is Judy Gedney. When you look at all her accomplishmentsâ€”her dozens of records, her numerous world and national championshipsâ€”and all her years of service as a coach, administrator, referee, etc., there is no one who has contributed in so many ways to the sport. And, when you consider that she didnâ€™t really begin lifting until she was about 40â€”what sheâ€™s achieved is truly remarkable. She is without equal. As for menâ€”Mark Henry would top my list. I first saw Mark lift at the state high school meet here in Texas where he squatted over 800 pounds back in 1990. Although his powerlifting career has been brief because of his involvement with Olympic lifting and pro-wrestling, Iâ€™ve never been around anyone who possessed his level of natural strength. Iâ€™d also have to list Bill Kazmaier, who trained with me in the early 1980s. I will never forget the meet in Columbus, GA in 1981 when be both broke the menâ€™s total record and I broke the womenâ€™s total on the same day. And, finally, Iâ€™d have to list Terry Todd, my husband. Terry not only had a great influence on my lifting career but encouraged and supported me in my work as an administrator and on behalf of drug testing. Heâ€™s also had a profound influence on many other male and female lifters as a coach and as a promoter. As your name goes down in history, what would you like to be most remembered for: I would hope Iâ€™d be remembered as a pioneer, of course, someone who both as a lifter and as an administrator helped made it possible for womenâ€™s lifting to first be accepted and then to grow in popularity. Of all the things I did in those early days, however, the thing Iâ€™m most proud of is the stance that I (and my husband Terry) took on the drug issue. I tried to demonstrate as a lifter that women could be very strong and still be clean, and I did my best to work for meaningful drug testing in both the USPF and, later, the ADFPA. Try to think of strength as an aspect of humanity and not something thatâ€™s gendered. I think a lot of womenâ€”even nowâ€”are limited in their pursuit of strength by our cultural identification with strength as â€œmasculineâ€ and weakness as â€œfeminine.â€ But strength is no more masculine than is speed, and I canâ€™t imagine anyone anymore who believes that women should not run as fast as they can. Get involved with the administration of powerlifting. For womenâ€™s powerlifting to continue to grow, more women need to become involved as referees, state chairpersons, and to serve in a variety of other administrative capacities. Women can only have a meaningful voice in running their own affairs if they take the time to get involved in administration as well as lifting. Thank your coaches for the hundreds of hours they devote to your training and success. Coaches are the unsung heroes of the powerlifting world and I know I would never have achieved even a fraction of what I did if it wasnâ€™t for my coach, Terry Todd, who showed me the way.